This post will be short, as I am feeling more ‘hands-on’ with my free time, and less like typing on a computer. Maybe it’s the weather. Can you blame me? I knew if I didn’t post this recipe soon, that it would get lost in my draft folder….. it’s not pretty in there. Dal Makhani has always been one of my favorite Indian dishes. Loaded with lentils & kidney beans this slightly creamy, and the perfect amount of spice, Dal Makhani was always my ‘go to’ after giving up Paneer years back. With the little one around, I have been growing fonder of the crock pot. Filling an array of ingredients into this magical slow cooker, forgetting about it for the day, and then when you arrive back, your home smells as if you been slaving away in the kitchen for hours…. maybe it really is magic! There is no need to soak the beans overnight when using a slow cooker. If you are in a bit of a hurry and feel you can't allow the full 6 hours, then by all means, soak away! Place both the lentils, and kidney beans in crock pot and cover with 4 cups water. Prep the onion, chili, ginger and garlic and add to beans. The cumin, fenugreek, coriander, and turmeric can then be stirred in with a spoon. Assemble cardamom, cloves, cinnamon, and bay leaf in cheesecloth and tie off. Add to beans. Set slow cooker at 6 hours. Once beans have cooked through, gently stir in butter, tomato paste, and coconut milk. Salt to taste, and add more water if desired. Any sort of basmati rice would be the perfect accompaniment to this dish. I made a turmeric seasoned rice, with a hint of saffron and some green peas. The cucumber salad was a nice crunch to the meal. Enjoy and let me know how it turns out! 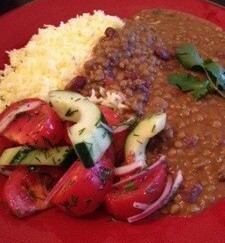 This entry was posted in Entrees, Gluten Free, Summer and tagged dal makhani, indian food, lentils, vegan vegpod. I have to say, anything in the form of a patty, cake, croquette, or once was a ball- then got squished, I am a fan of. Maybe its the versatility. Maybe its the fun of forming the shape. These cakes were incredibly easy to make, but did require a lot of pots and pans. I started with three pans. One to cook the lentils, one for the wheat berries, and one for the couscous, which was going to be my ‘binder’ for the cakes. Needless to say, I made a HUGE amount! We now have a freezer full of these yummies, which Im told, will be great for those first weeks of our babies arrival. The texture was great, credit to the wheat berry, and lentil combination. All in all there are two types of wheat berries, the hard, and soft. The hard wheat berries tend to keep there nice chewy texture, great for whole grain salads. The soft I tend to favorite more for stuffed squash, and a wheat berry breakfast oatmeal. I bet some cooked soft wheat berries would be insanely good in a spin off of an oatmeal cookie (note to self!) There are red and white varieties, as well as spring and winter. I’ve heard that the red wheat berries can be a tad more bitter, due to the extra proteins, but I can barely tell the difference. I think depending on what you choose to use them for, the color can play an important role. Other ingredients in these cakes included porcini mushrooms, onion, shredded carrot, lemon zest and juice, dijon, and some herbs and spices. 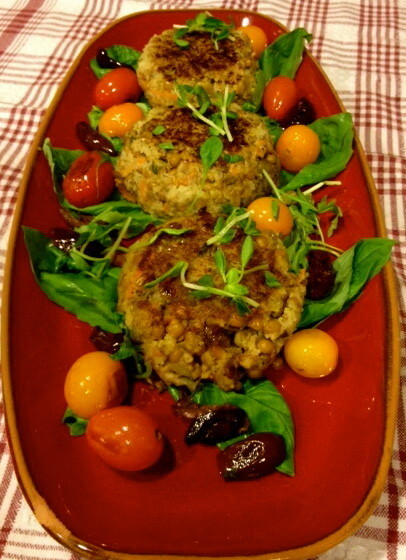 I served them above with some sauteed arugula, basil, cherry tomatoes, and kalamata olives. We then had them as a quick lunch the next day with some ketchup. Both we great. I am thinking a nice tart cranberry sauce would be lovely served along side. And I have a freezer full to experiment! 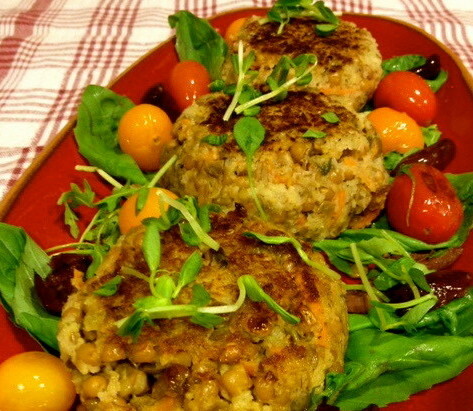 This entry was posted in Entrees, Summer and tagged cakes, lentils, vegan, vegpod, wheat berries.